Fans of all things beastly rejoice! 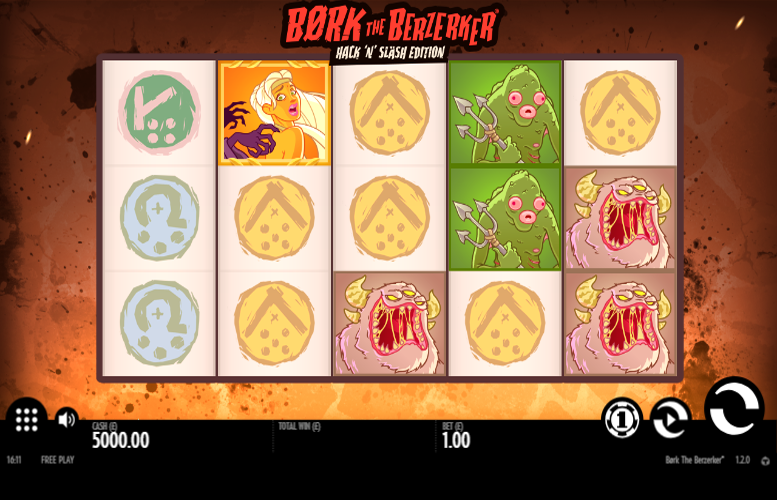 The Bork The Berzerker Hack N Slash Edition slot machine is under our microscope today. We’ll be looking at this Thunderkick title’s features, artwork, gameplay, and just about everything else to help you to decide if it’s the slot machine for you. The game itself is played over a standard five reel, three row board. It is beautifully illustrated with cartoon depictions of some savage monstrosities that you wouldn’t want to run into at night time! In terms of special features, the Bork The Berzerker slot machine is somewhat lacking. That said, it does have a free spin mode, as well an expanding “wild” symbol to boast. Let’s look closer at the title, warts and all! Great artwork. The symbol illustrations give this title a real classic comic book quality. Top marks! High return-to-player rating. It’s not often that games that offer more than 97% so when they do, it certainly impresses us! Uninspiring bonus features. Unfortunately, the gameplay of the Bork The Berzerker slot machine leaves a lot to be desired. Free spin modes and expanding “wild” symbols are great and all but they alone don’t make a legendary casino title! Small main game prizes. This seems to be a trend on Thunderkick games. Some players just can’t enjoy a game that doesn’t award huge prizes for hitting five-of-a-kinds. Thematically unclear. It’s obvious that the slot is about monsters, but we are given no indication who Bork The Berzerker is, who his other beastly companions are, or why they’re out to get the unnamed victim represented by the game’s highest value symbol. Orange victim = 50x the total bet. Green monster = 25x the total bet. Red snakes = 15x the total bet. 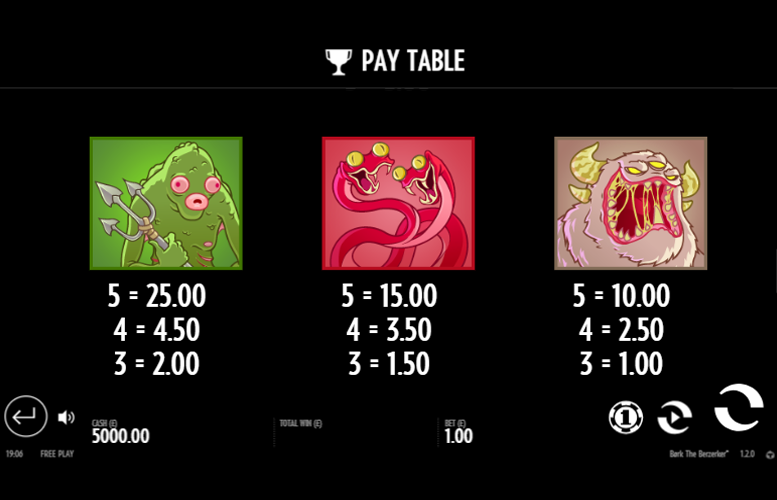 Pink monster = 10x the total bet. 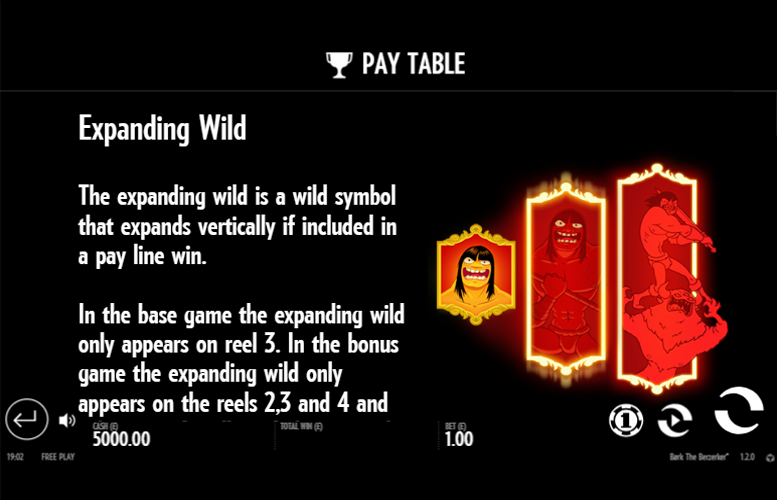 The expanding “wild” is a “wild” symbol that will expand vertically when it forms part of a pay line win. During the main game, the expanding “wild” can only appear on reel three. 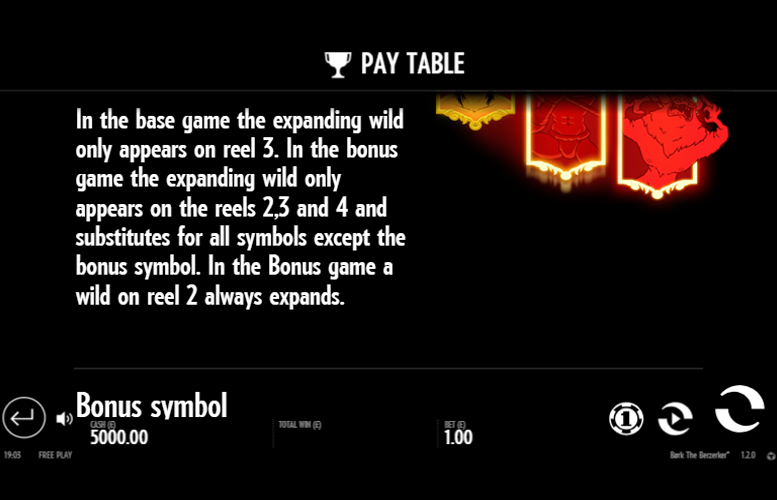 However, during the bonus game, the expanding “wild” can appear on reels two, three, and four. It will substitute for all symbols other than the “bonus” symbol. What’s more, during the Bonus Game, a “wild” on reel two will always expand. 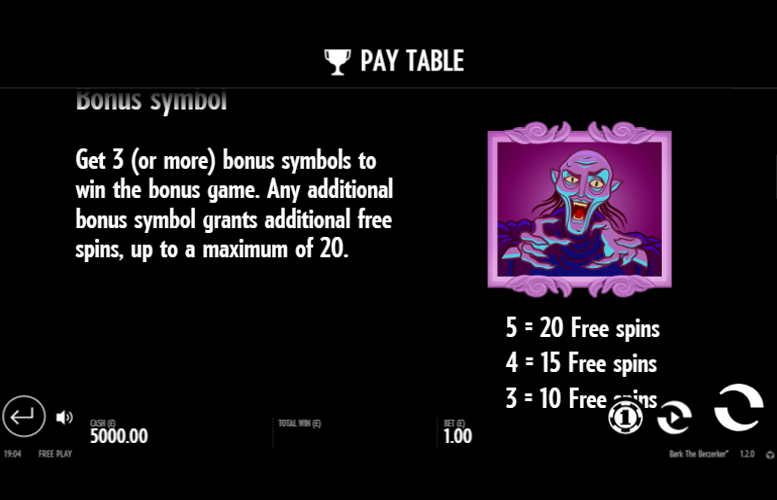 Landing three or more “bonus” symbols will award players entry to the Free Spin Bonus Game. Three, four, and five “bonus” symbols will grant 10, 15, and 20 Free Spins respectively. Orange and brown symbol = 4x the total bet. Green and purple symbol = 3.5x the total bet. Grey and blue symbol = 3x the total bet. 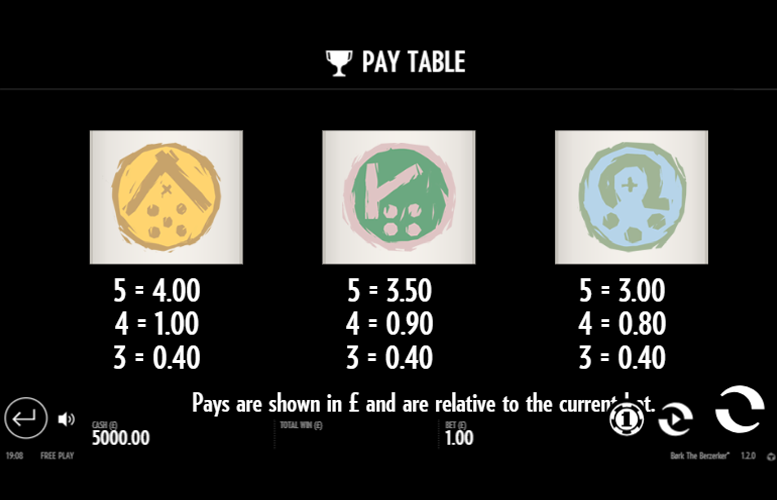 Unlike many modern video slots, there are no options for players to adjust either the number of win lines played on each spin or the number of coins bet on each one. Instead, players are simply given a series of total bet amounts ranging from a low of just 10p to a high of £100. Whilst these total bet amounts will likely satisfy most players, some of those with the biggest bank rolls around might find them a little limiting. All things considered, the Bork The Berzerker slot machine is something of a let-down. It certainly excels in the art department but unfortunately, this is about its only strong quality. The gameplay features that Thunderkick offers to players on the game can be found on many hundreds (if not thousands) of other slot machines. In 2018, it will certainly take more than an expanding “wild” and a free spins mode to impress us slot reviewers! That said, the Berzerker title does offer an impressive 97.3% return-to-player rating. This makes it an ideal choice of game for those players wanting to grind through the wagering requirements of a juicy bonus. This game has a rating of 3 / 5 with 572 total reviews by the users.